Chengdus & Don'ts: Malaysia, Simply Asia, for real! A view from our room of the Petronas Twin Towers. We arrived at our hotel last night around 12:00 am and we were all exhausted. Our flights were all on time, but it took a ton of time to get our bags and get a taxi at the airport. The cool thing about the taxis at the airport is that you have to buy a ticket to your destination before hand and you don't have to worry about the taxi driver trying to rip you off. Even though we were exhausted we were pleasantly surprised to open the curtains in our room and see the amazing Twin Towers. The main reason for coming to KL was to see this monstrosity. 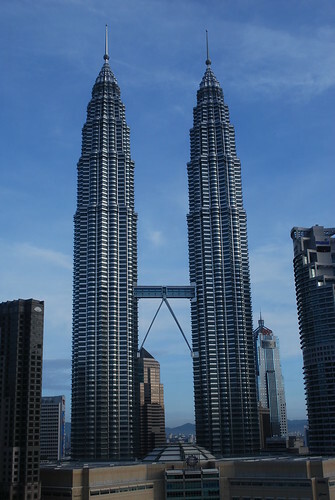 At 452 meters high it is the tallest twin towers in the world. I also believe it is the 3rd tallest building in the world next to a building in Taipei and then the Sears Tower in Chicago. We are on our way up it this afternoon, so we should have some great pictures of the sky bridge which connects the two towers together. I have now realized why the slogan for travel to Malaysia is "Malaysia, Simply Asia". It is an incredible combination of Asia. Where else can you have dim sum, curry, noodles, and rice for breakfast! The cultures here seem so intertwined it is quite incredible. Well, come visit me in Taipei and you can go up Taipei 101, the world's tallest building (until it's replaced by one in Dubai soon). Only problem with Taipei: all the yarn stores wrap everything in plastic. Hope you're all OK after today's earthquake!